This is the first of a 4-part series on the importance of a fast WordPress site and ways to speed up your site. 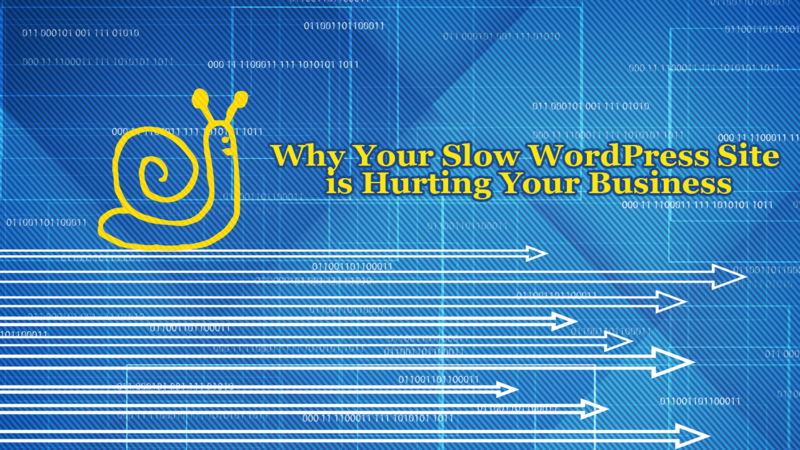 In this first article we’re going to look at why a slow WordPress site is harmful to your business and why it is critically important to have a fast Web site. It may seem silly to ask why you’d want a fast loading Web site because after all who doesn’t want a fast Web experience? But the question remains: does having a fast website provide real, measurable benefits? Does the speed in which your Web pages load really matter or is it just hype? The remainder of this post looks at some key ways that speeding up your slow WordPress site will benefit you. We’ll cover how you can achieve better success and how you can achieve better Search Engine Optimization (SEO). According to Greg Linden, co-founder of Amazon’s Personalization Group, Amazon loses 1% of their sales for every extra 100 milliseconds it takes their site to load 1. Current Yahoo! President/Former Google VP Marissa Mayer said at a Web 2.0 Conference, just a half second delay in the loading of a page caused a 20% drop in traffic and killed user satisfaction. According to Phil Dixon, of Shopzilla.com, at the 2009 Velocity Web Performance Conference, a performance enhancement they made that changed the speed of loading a page from 7 seconds to 2 seconds resulted in a 25% increase in page views, a 7-12% increase in revenue, and a 50% reduction in the server hardware they needed; all of which made them more money while lowering operating costs 2. According to Mozilla, when they reduced the load speed of their landing page by 2.2 seconds they saw that it resulted in 15.4% more downloads 3. According to Kyle Rush, the Deputy Director of Frontend Web Development at Obama for America presenting at the 2013 Velocity Web Performance Conference, during the 2012 U.S. Presidential elections, the Obama for America Web site page load speed was decreased 150% from an original 5 seconds down to 2 seconds and those same tests showed that donation conversions improved by 14% which resulted in over $34 million in additional donations 4. Every 1 second faster Wal-Mart’s pages loaded they saw a 2% increase in their conversion rates and the average page load time for people who purchased was 6.38 seconds but was 8.06 seconds for those who didn’t purchase 5. The Aberdeen Group research showed a 1-second delay in page loading time caused a 7% loss in conversion rates 6. As early as 2009, Google said that web page load time is important 7,8 and, at SMX Advanced in 2013, that slow loading mobile pages will pay a price in lower search ranking 9 and desktop pages will start being penalized. They suggested that a page should load in less than a second. The first thought might be that Google counts the total time it takes for the entire page to load. However, in 2013 MOZ.com did some testing, in concert with Google’s Matt Cutts, and they found that the total time to load a page had no impact on search ranking. What they did find is that the time it took the browser to receive the first response – called the “Time to First Byte” (TTFB) — had a direct correlation on the search ranking. That is, the faster the TTFB, the higher the search engine results position (SERP) and the slower the TTFB the lower the SERP, all other things being equal. Therefore, to help improve your SEO, it’s important to focus your resources on optimizing the “back-end” parts of your Web site to help improve the SERP of your pages. Of course, as we’ve seen over the years, the search engines keep changing their rules and algorithms as they attempt to provide a good experience for their customers (their customers being people who search), so expect front-end performance to become more of a factor in high SERPs in the future. So, if you had doubted the importance of having a fast Web site, you now know that it can be of critical importance to your online, and potentially offline, success. If you want to make sure your revenue, your sales, your conversion rates, and your search engine rankings aren’t being ruined by your slow WordPress site then you need to make sure you do everything you can to make it as fast as possible. Stay with us and we’ll help with that. In the next article in this series we’ll look at what it means to be a fast page; this is important because until you understand what a fast page is you won’t be able to make yours fast.